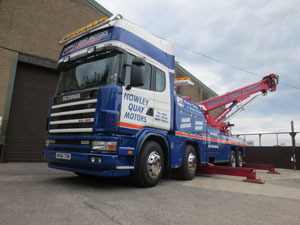 24 hours a day 365 days a year Howley Quay Motors Ltd is a large competitor in the recovery industry. Northwest area is where we provide roadside recovery and assistance for heavy and light vehicles, motorbikes, coach/buses. Specialising in all aspects of vehicle recovery operating a modern fleet of vehicles from service vans to larger commercial under lifts. All our vehicles are equipped with the latest technology, priding ourselves on a fast efficient, reliable and comprehensive service to the transport industry and the general public. For further information or to arrange the recovery of your vehicle, get in touch with us today by calling on the number at the top of the page. Alternatively, you can also get in contact with us by filling in the contact form with your details and query.